I am on many private Facebook or online groups with clergy who have safe spaces to lament about ministry, find support and accountability, and ultimately serve as the water-cooler to help people with the life they’ve been handed or made themselves. The stories are incredible: stories of personal failings, stories of dark nights of the soul, stories of ridiculous parishioners, stories of ridiculous superintendents, and stories of those moments that make it ALL worth it. All that is to say that in none of those stories is the presence of absolute certainty: that the call is perfect, that the life is for them, that they have everything figured out. And that clergy are just as uncertain about their role as any other profession–the only difference is the well from which we drink. So I cannot write today in response to the question “What’s your next step?” to find certainty in your call. I don’t think you’ll find certainty–not often, anyway. But if your call survives and empowers and makes all the difficult situations you find yourself in worth it…then you might find the call there, tested by fire. My hope for these participants is that they wrestle with uncertainty (it was my theme for Explo2011 by the way) and that their next step is to vision, bring together people who know you and whose opinion you trust, and see what directions make you tick. That your next step after Exploration is…more exploring! But doing so in an intentional way that, through prayer and the Holy Spirit, find ways to see what might be ahead. And even if the details haven’t all been worked out, that you take the plunge and see where you land. Blessings on your journey, and keep up with Exploration on the #Explo13 hashtag. I would implore the author to not refer to the Roman Catholic Church as the Catholicism, since (at least historically) the Methodist church has always been Catholic; in addition a large number of other churches also claim Catholicity; I would guess that at least a quarter, if not a third, of all churches include the word ‘Catholic’ in their name, including the Assyrians, many Eastern Orthodox churches, and the Old Catholics. We are discriminating against them, and also against Anglo-Catholics, among others, when we use the word ‘Catholicism’ to refer purely to the Roman Church, which is in its present form certainly Catholic, but for a Protestant to say it has a monopoly on Catholicism is somewhat unpleasant. That aside, I would be interested to know what aspect of Roman Catholic theology Rev. 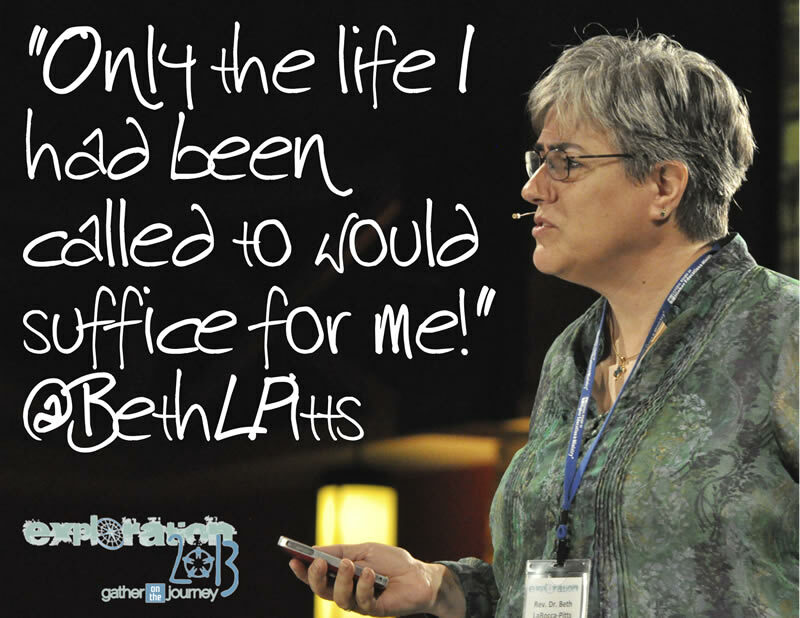 Dr. Beth La Rocca-Pitts felt discriminated against her developmentally disabled brother. I would not be surprised if the legacy of the Great Schism left an undesirable practice in place regarding this, but I’d very much be interested to know what it is. Hello, I’m a Roman Catholic, and I’d really like you to say how it is that we fail to give ‘theological meaning’ to her disabled brother? As Julie wrote below, it wasn’t that the RCC was discriminatory to her sister…it was that she found more to theologies present in the United Methodist Church that are not dependent on Natural Law like it is in the Catholic faith. That is not to say there wasn’t an incompatibility with the Roman Catholic Church. In her sermon, she spoke about her call to ministry being nourished and informed by her Catholic faith, but as she was a woman, she could not see herself in the pulpit in that tradition. Thus she left that tradition to worship with her mother, who was Methodist. So if there are any failings, it would be on the exclusion of women from the priesthood. Hi folks, Beth was raised Roman Catholic and (United) Methodist. Her disabled sibling was a sister – some seemed to have jumped to deciding Beth had a brother. From this piece alone, I don’t read that Beth says the Roman Catholic Church discriminated against her sister, only that the journey from one denomination to another gave theological meaning to her sibling, etc. 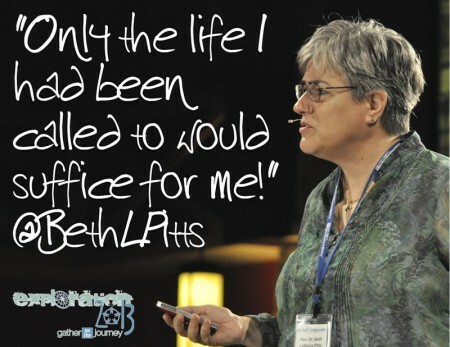 Beth is a gift to our Church, whether one is trying to decide to heed God’s call, a long time member, or a first time visitor. Her sermons will touch you deeply. To converse with her is even better. Francis may be right to object to this post, Julie, in that when you effectively state that the Roman Catholics are homophobic and prejudiced against the disabled, without providing theological justification for those claims, you are sinning against love by showing aggressive and unwarranted contempt for fellow Christians in another denomination. Now, I’d be the first to object to some excesses within the Roman church in the past, but to a very large extent, these problems have been or are being rectified; certainly the Roman church, in maintaining the Biblical doctrine (that is also a UMC doctrine, at least for the moment) regarding homosexuality; the need to love homosexuals, while affirming that the actual practice of homosexual activity is incompatible with Christianity, is not actually engaging in homophobia. This view, which abhors the ill-treatment of famous homosexuals such as Oscar Wilde and Alexander Turing, while maintaining our traditional view on the legitimacy of sexual relations only within heterosexual marriage, is held in common by both Methodists and Roman Catholics, and is inherently both Catholic and Orthodoxy. Now, regarding the treatment of disabled people, as I said before, I am not aware of anything the Roman church does that discriminates against them. The only theologies I’ve come across that strike me as being problematic for the disabled are those that feature a soteriological model which demands absolute personal, psychological awareness of the faith in Christ, and awareness of the meaning of sacraments in it (the complete rejection of infant baptism seems to me to at the very least inadvertantly imply the possible damnation of the mentally disabled); in no way does the Roman church accommodate that doctrine (although the views of Thomas Aquinas on the salvation of unbaptized infants, while less undesirable than those of Augustine, are still somewhat unpleasant). This important question must be answered by Beth, or by the author of this blog; because to simply state that the Methodist church provides theological meaning that the Roman Catholic church denies, to homosexuals and disabled people, without explaining why that is, is basically to call the Romans Nazis. It is directly equivalent to anti-semitism or Islamophobia, and comes across as a smear directed against the Roman Catholic laity rather than the specific theology of their confession, and recalls with horror the vile tradition of hatred which (until now, apparently) has never been a facet of Methodist theology. To Francis I can only apologize for how my denomination fails to respect his. It seems to me that with three major groupings of Christians (the Easterns, Latins, and Protestants), we have the opportunity to let the entire Church form into a living icon of the holy Trinity, but it seems that the clergy of the UMC in North America, who were historically known for their love and tolerance for other Christians, are no longer capable of moving in this direction. We must pray that God will have mercy upon us and deliver us from cruel, arrogant and elitist heretics who seek to reinvent our respective churches in the form of a neo-Gnostic nightmare. Paul Anthony, you said “Julie, in that when you effectively state that the Roman Catholics are homophobic and prejudiced against the disabled, without providing theological justification for those claims, you are sinning against love by showing aggressive and unwarranted contempt for fellow Christians in another denomination.” Read back to my words. I never said – or implied – that about the Roman Catholic Church, paraphrasing my won words or Beth’s. The problem with this remark is that simple: how does Catholicism fail to provide theological meaning to the developmentally-disabled? I could buy the argument regarding homosexuality, even if I disagree with it; in my view if its not in any way anti-gay to insist upon the traditional Christian restrictions on sexual activity, which exist because of a Christian preference for celibacy versus sexuality in almost all contexts, except that UMC teaching on homosexuality, at the denominational level, is actually the same as the Roman Catholic teaching. Homosexuals are individuals of sacred worth, but within Christianity they are required to, like the vast majority of Christians alive at any given moment, remain in holy celibacy. I myself, although I don’t consider myself gay, at different points in my life have actually experienced the temptation towards homosexuality, yet I have resisted the urge purely on the basis of my faith, and the strictures it places on me. This is also a major reason why I personally favor the theology of self-denial; I feel that we Methodists could benefit from fasting more and indulging ourselves less. However, what seems to be fueling the real fire of controversy is the remark involving the developmentally disabled; it does seem to me that this controversy could have been avoided had the author of this blog, and indeed La Rocca-Pitts, taken the trouble to explain precisely those aspects of UMC theology that they feel give more meaning to the developmentally disabled. I personally have always felt that some Baptists might inadvertantly (yet surely not intentionally) discriminate against the developmentally challenged, yet I have never within Roman Catholicism (or indeed Methodism, aside from some so-called “Methobaptists”) encountered anything that troubled me, in that manner. Purgatory, indlugences, Papal supremacy and so on all are frequently-raised theological bones of contention with a wealth of polemic material on either way (and contribute to my remaining a Methodist rather than ‘crossing the tiber’), not to mention the horrible tragedy of the sexual abuse scandal, which did so much damage to the entire Christian community and made people afraid of priests, but I haven’t personally come across anything that would seem to deprecate or diminish the role of the disabled. Now within the Syriac Orthdoox Church, which I am very fond of, as UMJeremy can doubtless attest, one Syriac congregation I visited had a severely developmentally disabled member, who in addition to suffering from mental retardation, was also physically disabled to the point of being unable to eat. Yet he was allowed to participate fully in the life of the church, in spite of occasionally accidentally disrupting the divine liturgy, and was even given communion in an extremely careful manner; his father furthermore also served as one of the ushers. Now I don’t know if the Romans would be that accommodating; I don’t even know if the Methodists would be that accommodating, certainly, I can see how many Christians might just recoil in horror, and fail to imitate the example of Christ, in caring for such an individual, that said however, I personally want to believe that both the UMC in which I was raised, and the Roman Catholics, would shower such a congregant with the same love showered upon him in the Syriac church.